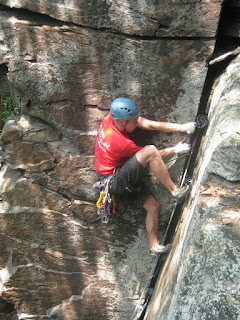 I added more details to the Loudon Heights page, the main climbing page as well as adding a seperate page with notes for the Shenandoah River cracks. If you get out to Harpers and gather some photographs feel free to share them. 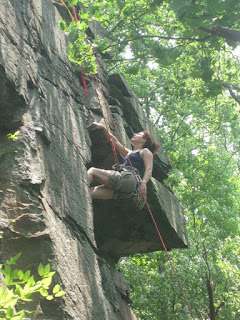 Send them to conrad at harpersferryclimbing dot com (email address). 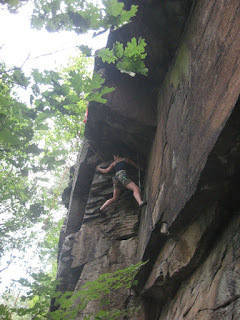 In the photo I'm climbing "Air Show" 5.11 at Skink Rock. Photo by Jeff, Carl or Indy? I can't remember, sorry guys. I added a few more things to the site. 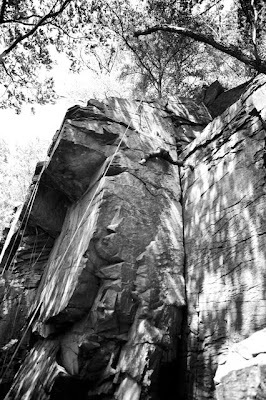 Updated the Giggling Boulders with a couple images. I also refined the update on the Loudon Heights Main cliff area by labeling where the photos are taken from by putting numbers in the overview photo. 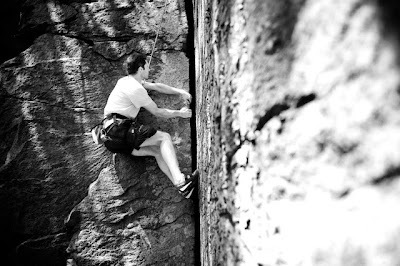 Now you can navigate to some of the great climbing at Loudon Heights more easily. This might be one of the last updates for a while. Most of the trip to MD photos are up here on the blog and I won't be getting any new info unless Jeff, Ryan, or one of the other crew send in pics. Enjoy this short video of a Hog Nosed Snake on Maryland Heights. PS Don't go poking snakes b/c we did. Placing a #4. 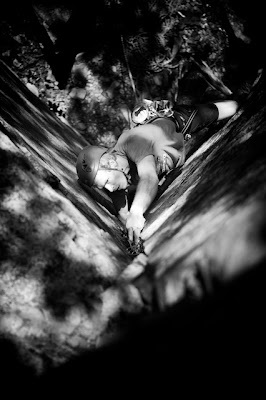 Lot's of good gear on this route. I have updated the web guide to include info on many areas previously not covered. 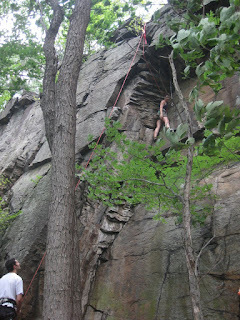 These include most of Loudon Heights, the River cracks/walls, Chestnut Hill Rd, the Train Tunnel Wall, and the Outlying Area cliffs and bouldering. 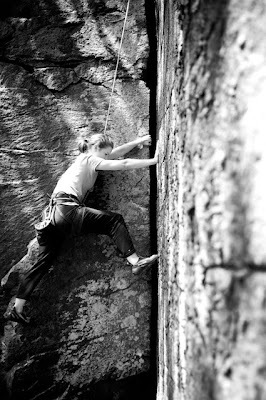 I have also updated Balcony Rope and Bouldering with pics. Indy and Michelle put up a line at Skink Rock and called it "Driving With The Top Down". 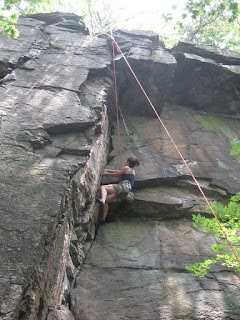 Michelle is high stepping on this route in the picture. Photo by Indy. 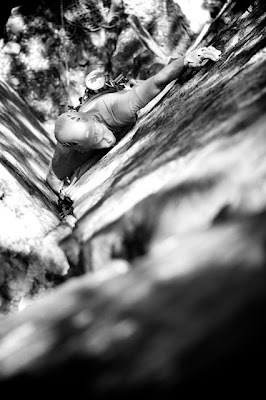 Aura Cranking "Rags to Riches"
Conrad leading "Carpet Crack" (5.8). This crack takes #3 up to #5 Camalots. You can jam it, layback it, or stem through the corner. It's your choice. More of this one later! Skink Rock Session Went Great! 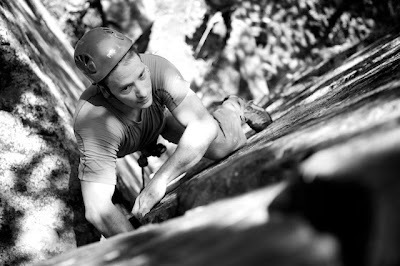 The below photo was taken after our Skink Rock climbing session which lasted from about 9:30am till about 5pm. 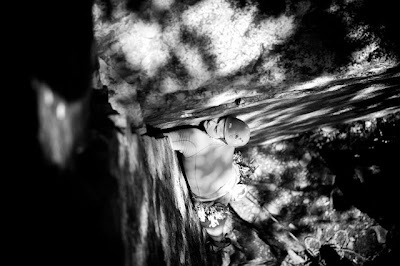 It was a long, shady, breezy day of climbing. 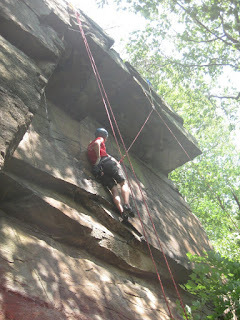 We all did at least 4 climbs and some of us did closer to 12 routes. 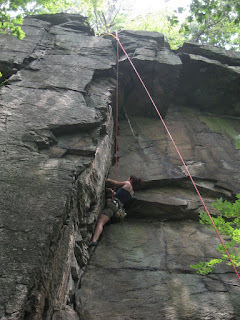 We top roped climbs, and lead cracks on trad gear. Carl took a nice fall on a cam and caught nothing but air on his way down. Indy showed up to sign some books, kiss some babies, and shake some hands. Two people and a dog are missing from the photo b/c they had to leave a bit early. In the photo from left to right is Michele, Indy, Aura, Jeff, Conrad, Carl and the town of Harpers Ferry. The two missing persons are Ryan and Larissa and don't forget their faithful companion Sadie the black rock dog. 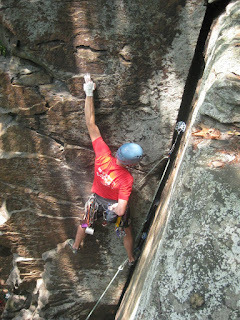 In the photo below you can see the long slab wall that makes up the left side of Skink Rock. You can see the dihedral crack to roof, that is visible in a photo in the previous post, in the right side of the photo below. Below is a side pic of the Skink Boulder. 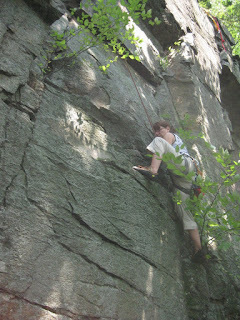 You can see the Skink Rock boulder in the photo below from the trail above the cliff. The cliff is down and to the right below the boulder. I'm in Maryland for vacation. Here are some photos to update the site. Skink Rock from a different perspective. The Train Tunnel Wall (notice me in the picture for scale). This wall is big! I ran into a new kind of snake to my travels at Harpers Ferry. This snake known as the Hog-Nosed Snake is not poisonous. It is very intimidating though b/c it hisses and flares a hood like a cobra! Scary! Normally it has a thin neck. In the photo below notice the hood.